What we know about Hiram's early life in North Carolina might as well be next to nothing. He was born in about 1795 somewhere in North Carolina.1 His parents and any other sibilings are unknown for sure, though there is speculation regarding possible brothers or sisters. On March 12, 1812, a Hiram Webb married Sarah Holifield (last name may be misspelled) in Rutherford County, North Carolina. This has been confirmed by a marriage license from Rutherford County. It appears that this is probably not the same Hiram that came to Tennessee, Alabama, and Mississippi though. If Sarah was "our" Hiram's first wife, she would probably be the mother of Hiram's first known child, Mary Ann "Polly" Webb, in 1814. A second daughter, Lucinda Webb, was born in 1815 in North Carolina. However, Rick Reed has pointed out that there is indeed a Hiram Webb, living next door to some Holifields in Burke County, North Carolina (next to Rutherford), in the 1820 census. Since the Hiram that was living next to the other Marion County, Alabama, immigrees was living in 1820 in Lincoln County, Tennessee, it seems like this Hiram in North Carolina in 1820, and therefore the husband of Sarah Holifield, must have been a different one. Rick has also had contact with Eileen Turner, who has found a Hiram Webb in 1835 in Rutherford County, North Carolina, in the Rutherford Voter Poll Book. This would apparently confirm that "our" Hiram Webb was not the same one that married Sarah Holifield. So, was "our" Hiram married to someone else before he married Mary Rebecca Blaylock? The possibility remains open. #30. July 1815. Recognizance. Bastardy. Whether or not this is our Hiram, the one that married Sarah Holifield (maybe ours too! ), or another one has yet to be seen, but it remains quite possible that he is. A relatively large problem occurs with his earliest children. Mary Ann and Lucinda seem to have been born in 1814 and 1815 in North Carolina (census data), but we do not know for sure that Hiram had even been near the Blaylock family until he moved to Tennessee. So are they children of an unrecorded first marriage in North Carolina? Or, did Hiram marry Mary Rebecca before her family moved to south Tennessee? There is a big gap between them and his next child, John G. Webb (born in 1822 in Tennessee). We do not know where Mary Rebecca's father was living in 1810, but in 1800 he was in Montgomery County, North Carolina. This problem is compounded by the fact that we do not know exactly where in North Carolina Hiram lived. For the time being, I consider Mary Ann and Lucinda, tentatively, as children of Hiram and Mary Rebecca Blaylock. It seems possible that Hiram could have been living near them in North Carolina, and that he and Mary Rebecca married at a very young age before they moved with her father to Tennessee. But the possibility that Hiram had an earlier wife must remain also. Hopefully further research in North Carolina will turn something up to elucidate this point in Hiram's life. The female here is assumed to be Mary Rebecca Blalock Webb, his (possibly second?) wife. Their marriage date is unknown, as discussed above. I would not think it possible to be earlier than 1813 and not much later than that either. It is theoretically possible (but not likely) that this woman in the 1820 census was an earlier wife of Hiram's, but I think it probably was Mary Rebecca. So the next question is how do we know that Mary Rebecca Blaylock, was a daughter of David Blaylock, and the wife of Hiram? (1.) In 1837, in Mary Rebecca Blalock's father's pension file, Margaret Robinson (Mary's sister) states that she (mentioned as "Mary Webb" earlier in the document) has been gone for over 15 years [see this statement]. This would seem to mean that Mary had moved away with Hiram sometime around or before 1822, and therefore in 1820 it would be possible that the two had already married. (2.) In 1820, Hiram and his family also lived within a few houses of David Blacklock (Blalock), Mary's father (further increasing the likelihood that Hiram's wife at this point is Mary), as well as very near James and Thomas Evans. (3.) The third son of Hiram and Mary Rebecca is named David Blaylock Webb. Thus, the marriage is not absolutely proven, but it sure seems like it was so. 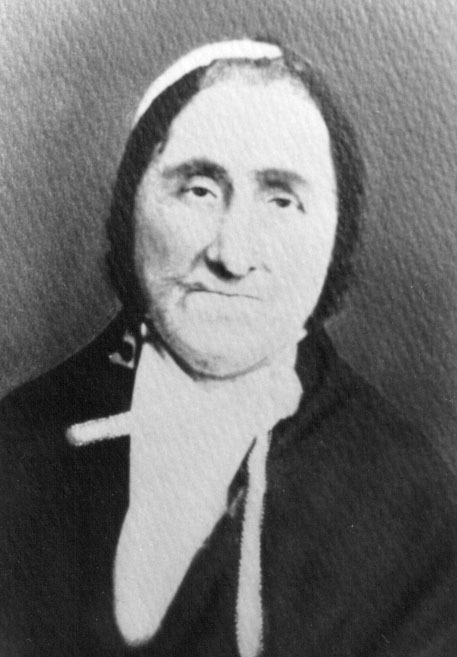 Mary Rebecca Blalock was the daughter of David (Harrison) Blalock, a Revolutionary War veteran who had moved away from North Carolina, into Tennessee to finish the last twenty odd years of his life [web site on David Harrison Blalock]. Mary was born in Chatham County, North Carolina sometime around 1795. She was the daughter of David Blalock and (possibly) Karen Vaughn, David's second wife. We know nothing about her personally, but a photo of her in her old age has survived (miraculously!). Thomas Evans, probably James' son, was first married to a Mary Webb, or so goes a family tale [related to Shanta Jones from her grandfather]. When Mary died in about 1835, in Itawamba County, Thomas married Lucinda Webb, Hiram's daughter. This Mary Webb was supposedly the aunt of Lucinda, who had been living with Thomas and Lucinda for a short while and who was about 19 years old when she married Thomas. This would mean that Mary was an older sister of our Hiram. This seems highly possible. Thomas and Hiram both moved from Lincoln County, Tennessee, down to the Itawamba/Marion counties area and settled there. 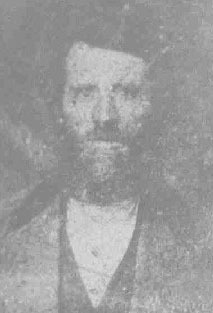 Flint River Pioneers and James/William Webb, Possible Father of Hiram? The location in Lincoln County where Hiram and the Evans were living is not exactly known, since no land records exist for Hiram or for James Evans that I have found, but I have been able to pin them down to a relatively small area just off the Flint River (in the southeast part of the county). The way they are located is through the several mentions of David Blaylock in land records. Survey records for land that David Blaylock owned (and in the 1820 census he was living one house from James Evans, two from Hiram Webb, and three from Thomas Evans) show that in 1824 he was probably living on the Barren Fork of the Flint River. His land is said to border James Evans' land. The map included above attempts to show approximately where they were living. Although we do not know who Hiram's parents were, two possible candidates can be found in this same area, living almost on exactly this same land. 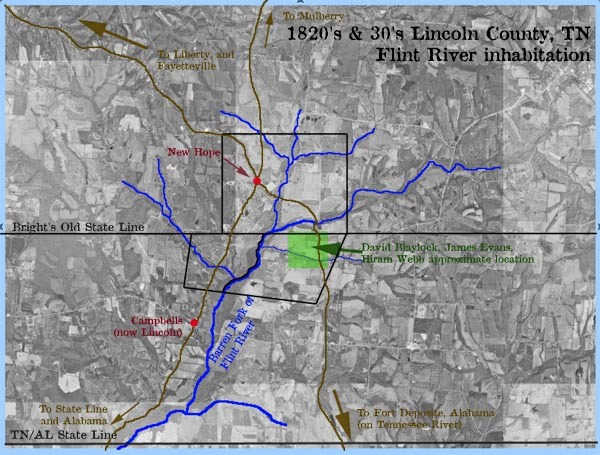 Given the history of the Flint River pioneer settlements, we know that Hiram or his family had not been there long. All of this land was uninhabited until 1806, when a few trickled in. The state line with Alabama was laid out, incorrectly by James Bright, in 1806, and two large 1000 acre land grants were quickly marked off for wealthy North Carolina land speculators: one for George Doherty, and one for Daniel Gillespie. Neither ever came to Lincoln County, and when Gillespie died, his heirs sold the 1000 acres (north of Bright's Old State Line) off at an early date. Doherty died very quickly and some of his land was awarded to the agents who represented him in Tennessee. Some of this land was given by the court to William P. Anderson, the Surveyor General for the 2nd Surveyor's District of Middle Tennessee. 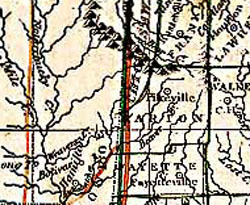 The county was established in 1809 from Bedford County and almost immediately Trotter's Fork (the branch off the Flint that comes closest to New Hope) was settled. In 1810, James Roseborough built a mill on the Flint River a little east of New Hope, the same year the Mulberry to State Line road was laid off, which also ran through New Hope. It was 1819, when William P. Anderson sold 78 acres of land to James Webb, probably just south of the Flint River at the Walker's Ford. We don't know who this James Webb was, but at some point between later in 1819 and 1824, the land was sold or deeded to David Blaylock. But it was not James Webb who handed it over, but a William Webb. Whether this William Webb was an heir to James, or possibly even James himself (James William Webb? ), we do not know. I think it rather likely, given the small amount of land bought by James Webb, that he would have been the first settler on this tract of land. However, when the census of 1820 recorded this area, there was no James or William Webb mentioned. David Blaylock is living here, next to the Hurleys and also the Evans. The only Webb is Hiram Webb, living in between James and Thomas Evans, and two houses away from David Blaylock So why is Hiram here as the head of a household, at the young age of "16-23" (probably about 23-25 I think), but not James or William Webb? 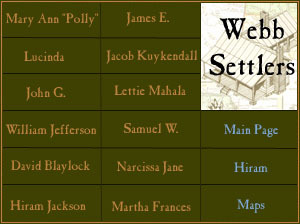 A number of scenarios are possible: James/William had already sold the land to Blaylock and left/died, leaving young Hiram living there next to his father-in-law; that William could have been Hiram's name also; that the census did not record the others Webbs who might still have been there, or off in the woods (by 1820, much of the lands further back off the river were still uninhabited and even unclaimed); or that Hiram had come with David Blaylock from NC and had no ties whatsoever to these earlier Webbs. We now know through DNA testing that some of Hiram's kin (brother, nephew or cousin) lived near Blanche, Lincoln County, which is in the south part of the county. Joseph Webb had the exact same 25 marker DNA strand as Hiram, but we do not know how close kin they were. If it is true that Joseph married his wife in Albemarle County, Virginia, then came to Lincoln County, then our lines are even more confused. Joseph doesn't appear to have any ties to the area that Hiram was living on, nor does he appear in any type of legal or land documents with Hiram. Jacob Webb - 2 males under 5, 2 males 5-10, 1 male 30-40, I female under 5, 1 female 5-10,, 1 female 10-15, 1 female 20-30. in Walker co Al. who i believe moves to Marion Co. he would be the later Jacob Sr of Pa. with son Kibble. George Webb 1 male under 5, 1 5-10, 1 30-40, 1 female under 5, 1 10-15, 1 30-40. Marion County for the rest. Thomas Webb 2 males under 5, 1 5-10, 2 15-20, 1 30-40 two female under 5, 1 20-30. There are also names we are familier with around them like Thomas Noe, Samuel Pennington, Peter Noe, John Boles, Sanders Wilkerson, John Blalock, and John H. Rea(Ray). From this point on, Hiram and his family continually lived either in Itawamba County, Mississippi or Marion County, Alabama. The border was not very far away from either place and they seem to have either moved around a bit or the census takers may have just been confused and the family actually stayed put. For a time they lived in the Gum Community of Itawamba County, near Lick Skillet Creek. This is where most of the family would live after Hiram's death, so I think this is the location of the family through the 1830's, and the location of Hiram at his death. In 1836, Hiram was not listed on the Itawamba County, Mississippi, State Tax Rolls. I am not sure why this is so, but the family may have moved over into Marion County, or just missed the tax roll (not likely in my opinion, since a tax collector is not going to miss people unless they are extremely well hidden! ), so the family must have still been in Marion County, Alabama. I do not know much else about the family from 1830 to 1838 though. But in 1838 tragedy struck. From family lore, and I do not know how it originated or even came down to me, Hiram supposedly was working at a stave or shingle mill (according to the version of the story I have heard) very close to the Mississippi/Alabama border, when he somehow got caught in a large grinder or suffered some other lethal accident. He was died immediately and was given a hasty burial near the site of the mill, such was the condition of the body. I have heard that "the family burial ground" sprung up around this spot, but I have not seen this verified and actually am suspicious of it. I guess the "family burial ground" could refer to Clover Ridge Cemetery, but I do not know for sure. Before he died, Hiram had about twelve children. Mary Ann and Lucinda are mentiond above. John G. Webb was the first one, born (I think this in incorrect) in 1822 in Tennessee. William Jefferson "Billy" Webb was born on July 1, 1822 in Lincoln County, Tennessee. David Blalock (named for his grandfather) was born either in 1823 or 1827 (I have seen both dates listed and am unsure which is right). Hiram Jackson Webb was born in 1824 in Alabama and James E. Webb was born in 1828 in Alabama also. Jacob K. Webb was born in 1829 and Lettie Mahala Webb was born on July 30 in either 1829 or 1831 in Alabama. Samuel Webb (whom we know the least about) was born in 1833 in Alabama and Narcissa Jane Webb was born there in 1835. Their last child, Martha Francis Webb, was born in 1837 in Alabama. Township 9, Range 10 East, Section 20, NW 1/4, Ita. Co., MS.
John H. Paschall and his wife Mary deed to John G. Webb for the sum of $250 the entire NW 1/4 quarter section of Section 20, and also the entire NE 1/4 quarter section of Section 19. The transaction took place on November 4, 1853. Mary and John lived together for at least 23 years. The photo of her that we have preserved for us must have been taken near the end of her life. She passed away sometime after 1870 probably around Sulligent, Alabama. John died in 1871 in Sanford, Alabama. The couple had no children. I do not know where she is buried for certain, but I have been told it was at the Evans Cemetery northwest of Sulligent. I have not seen this piece of information confirmed. Many of their children stayed in the Northeast Mississippi/Northwest Alabama area. My personal line comes down through two of Hiram's children, and my parents had no idea that they were eighth cousins, through Hiram's son Billy and his daughter Lucinda. Instead of trying to list all of Hiram's descendants in one place, I hope to place a sub-page for each of his children and then go from there. It would break them up into more manageable sections. I hope that you have found this site useful and please, feel free to contact me or, probably more effective, someone closer to your own line. It's almost impossible to try and handle all of the children's groups with ease (though Denise Gregory comes closer than anyone I know in being able to handle it all! ), but thankfully we have a number of very talented people working on different lines of Hirams. I will try to include email addresses or contacts for each of these lines. 1. Hiram's birthdate of 1795 has been passed down to me by a source which I am no longer able to confirm. The 1820 census of Lincoln County, Tennessee, gives a date of birth for him between 1797 and 1804. The 1830 census of Marion County, Alabama, gives a date of birth between 1790 and 1800. So the closest we can come from this is 1797-1800. His place of birth has been listed as North Carolina through several of his children's census reports later in their lives. Lincoln/Franklin County, Tennessee maps available at The Maps our Ancestors Followed. Itawamba County, Mississippi maps from the Itawamba County USGENWEB site. Photo of Mary Rebecca Blaylock Webb (original owner currently unkown) and photo of Billy Webb courtesy of Mrs. Denise Gregory of Cameron, Oklahoma. Photo of John G. Webb courtesy of Ms. Judith Williams. Photo of Jacob K. Webb courtesy of Ms. Ruby Irvin. Photo of Lettie Mahala courtesy of Mrs. Barbara Carruth of Sulligent, Lamar County, Alabama. Photo of Narcissa Jane courtesy of Mrs. Wanda James of Poteau, LeFlore County, Oklahoma.